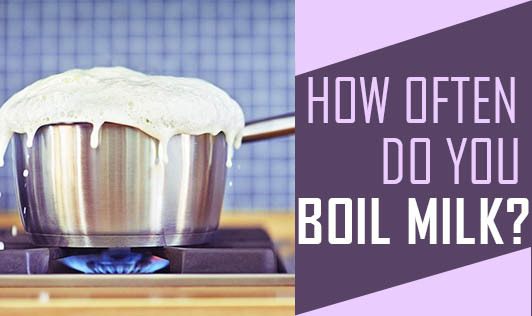 How Often Do You Boil Milk? You must have seen the recent ad on health drinks that claim boiling milk kills the nutrients in the milk. How many of us know that boiling and reboiling milk can affect the nutritional quality of milk? The practice of reboiling milk often affects the Vitamin B group, especially vitamin B2, B6 and B12. The protein in the milk also gets denatured making it unavailable for the body cells and tissues. When we reheat milk often, there is a thick cream layer on the milk, which we skim off. It is not just fat, it also contains the fat soluble vitamins like A, D, E and K. So, in this way, most of the nutrients in the milk are lost. So what is the best way to retain the nutrients in the milk? If you are using pasteurized milk, boiling it for a minute or two actually increases the shelf life of the milk. Every time you use milk, you need not boil it. It can be heated just to the desired temperature you want. Milk with tetra packing need not be boiled. It can be used directly. Boil milk wisely to reap the maximum nutrition out of it!